Ever since an unhappy report from new investors, the Olive Garden has worked feverishly to reinvent itself. A big part of that reinvention involves the most singular item on the menu: the breadstick. 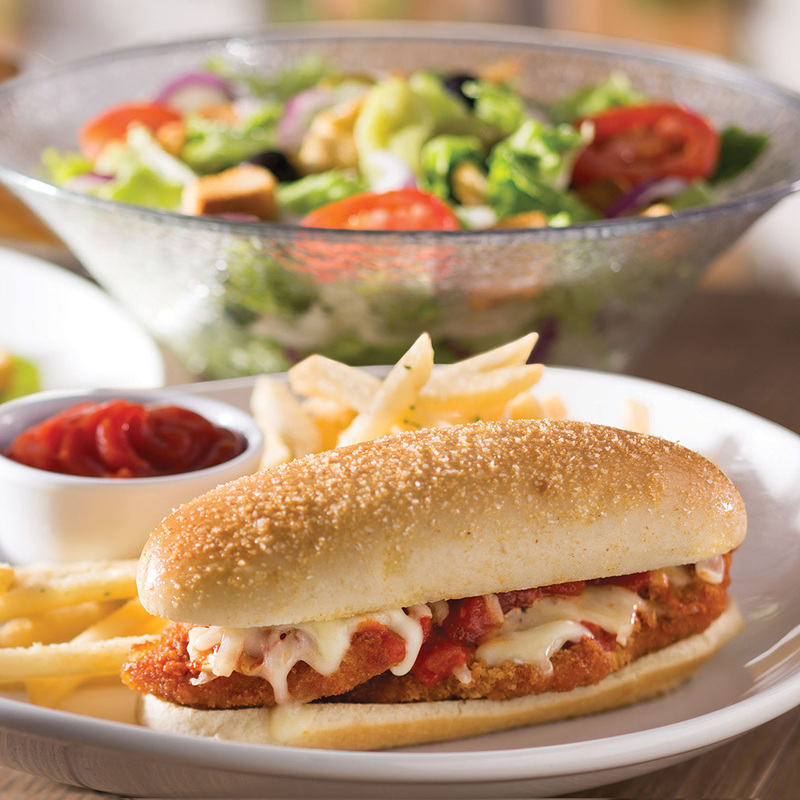 And the most buzzed-about idea for the breadstick is undoubtedly the breadstick sandwich. Today at lunchtime we got to try the breadstick spin-off that spawned 1,000 retweets from the comfort of the FWx editorial desk. The breadstick sandwich is such a reasonable size, guys. We know, the whole point of Olive Garden breadsticks is that they continue to arrive at your table long after you've finished dessert—sometimes even after you’ve left the restaurant—but that sort of gluttony is just a terrible way to eat lunch. We didn’t get the measuring tape out, but our chicken parm was easy to hold in one hand. Now if the only thing to recommend the sandwich was its holdability, this review could probably end here. But after a few cautious bites, I’m happy to report it tasted pretty good, too. The last time I was in an Olive Garden was the night before a high school track meet—a time the investors responsible for taking OG to the woodshed would certainly refer to as a dark time for the chain. I remember gloppy noodles and soggy cutlets. The chicken parm I ate today, by comparison, was surprisingly crisp—a fact made all the more surprising when I considered that it arrived after resting in marinara sauce for I don’t know how long while it moved across Manhattan in a downpour. Unfortunately for breadstick lovers, it’s not all good news. The breadstick had a sheen on it. It was coated in so much oil that when I finished, my mouth felt like it had undergone a DIY spa treatment. I’m willing to give the Garden the benefit of the doubt—it’s possible the breadstick took on a soaked, slippery characteristic in transit. But still, it made it a little challenging to eat and also to type now that I’m done. Finally, while this might not be a problem depending on what time of day you choose to indulge in a breadstick sandwich, upon finishing a fellow editor said, “Well, I would like to go lie down now.” They haven’t put the nap pods in the FWx office yet, so she had to tough it out. The restaurant just sent an army of food trucks on tour, bringing breadstick sandwiches to 20 cities around the country, and if I had a late-night craving, I’d line up to get one. I don’t know if an after hours menu is on Olive Garden’s radar, but if they want to expand their family there are probably a lot of people who will wander out of a nightclub or karaoke bar this Friday night/Saturday morning who would like to join.